It’s the most infamous tower in Paris’s history – and were it not for a certain Mr Eiffel, it would also be the city’s most famous. The Tower of Nesle (pronounced ‘Nell’) provides a perfectly grim and imposing backdrop when Angélique finds herself cast on the scrapheap that is the Court of Miracles. Just about every location in the whole Angélique story is real, and the Tower of Nesle is no exception, though it was demolished some 350 years ago. It was built in about 1200 and was originally named after a provost of Paris, Philippe Hamelin, forming an important part of the city wall constructed by Philippe-Auguste, then King of France. There are many surviving drawings, etchings and paintings of the tower and we know the precise layout of the building (there is a plaque illustrating its plan on the Institut de France which stands where the tower once stood). It was three stories high and the flat roof served as an observation deck, but whether the arched ceilings also fell back into a central pillar is a matter of conjecture. One thing is certain: it must have made an impressive sight at the western entrance to the city, just downstream from the still standing Pont Neuf, where the Seine divides to encircle the Ile de la Cite, the island where Notre Dame stands. And the tower must have been even more magnificent in the early 14th century when a large gate was erected nearby. On the opposite bank of the Seine, separated from the Tower of Nesle by the Pont des Arts, stood the Louvre, now the world’s greatest gallery, but then the royal palace of King Philippe IV, with its equally splendid gardens of the Tuileries stretching westwards along the river. 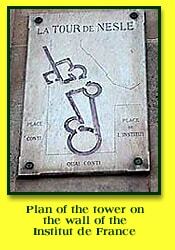 The strategic position of the tower opposite the Louvre was not only significant for Angélique, who watched the antics of the court – and no doubt relived incidents from her past – while living in the tower. Three centuries earlier, it was the ability of those living at the Louvre to spy on the comings and goings of lovers and mistresses at the tower and the hotel which gave Paris one its most celebrated scandals. The year was 1314, the 30th and last of the reign of Philippe IV, when three wives of the king’s sons – all three of them future kings – were spotted indulging in secret liaisons at the tower. The princesses’ three lovers were naturally castrated and violently executed, while the royal daughters-in-law received different punishments. One was forced to take the veil and another, who was married to the future Louis X, was later suffocated between two mattresses when the young king decided he wanted to take a new wife. The third, Jeanne de Bourgogne, was not only forgiven by her loving husband, Philippe V, but was given the Hotel de Nesle, where she lived for seven years after his death in 1322. Legend has it that she would watch from the tower for passers-by, send for them, and, after exhausting their sexual potency, delighted in tying them up in sacks and lowering them from the tower to drown in the river. True or not, such tales gave the tower a noteriety it would never shake off, and it began a slow decline while the rest of Paris expanded and blossomed into arguably the greatest city of its time. By the reign of Charles IX (1550-74) the tower was no longer considered suitable for royal occupation and was let out to private individuals. Its rundown state must have contrasted even more with the Paris of Louis XIV, and by the time Anne Golon’s fictional Calembredaine got his villainous hands on it, it was nearing the end of its life. 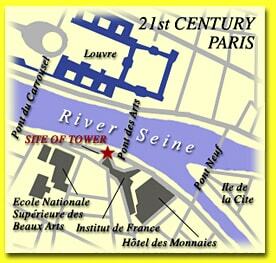 Angélique’s brief stay there was in 1661 – four years before the real-life tower was demolished. Anne Golon was by no means the first author to exploit the Tower of Nesle’s gloriously inglorious past by using it as a setting for a story. Two of France’s other great literary names got there first. 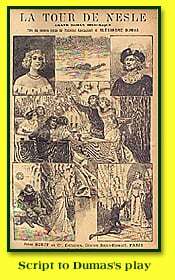 Aloysius ‘Louis’ Bertrand resurrected the story of the adulterous Jeanne de Bourgogne in his poem, Le Tour de Nesle, while his contemporary, Alexandre Dumas, used the same title for his 1832 play (several years before his much more famous stories, The Three Musketeers and The Count of Monte Cristo, were published). Dumas’s play would even be the inspiration for five movies between 1923 and 1968. The last was made in German and either dubbed or sub-titled for cinemagoeers in France, Italy and the USA, where it was bizarrely re-named The Tower of Screaming Virgins. They sat before the fire in the big room below the Tower of Nesle. Calembredaine’s henchmen were foregathered there with a crowd of ragged tramps, come to pay court to the potentate of their gang. Every night, this stinking, vociferous rabble swarmed all over the place amid the screaming infants, the belchings and invectives that resounded under the domed roof, the clatter of tin tankards, and the unbearable stench of old rags and wine. Wood-Bottom was perched on the table with the arrogance of a trusty manager and the sombre air of an unappreciated philosopher. Barcarole, his crony, gambolled from one group to another, exasperating the card-players. Rat-Poison was selling his day’s hunt to some famished old hags. Thibault was turning the handle of his hurdy-gurdy while casting mocking glances through the slits in his straw hat, and Linor, his little follower, a mudlark with angel’s eyes, was beating his cymbal. Mother Hurlurette and Father Hurlurot began to dance and the firelight threw their grotesque, lumbering shadows on the ceiling. This beggar couple, Barcarole said, had but one eye and three teeth between the two of them. Father Hurlurot was blind and scraped a kind of bow with two strings strung across it which he called a fiddle. His wife was one-eyed, heavy, with an enormous mane of grey hair falling from under her dirty linen turban; she played the castanets, while jigging her big, bloated legs, wrapped up in several layers of stockings. Barcarole said also that she must have been Spanish… a long while ago. All that remained were the castanets. It was the Tower of Nesle’s finest hour.